Zoey #5110 - Yankee Golden Retriever Rescue, Inc.
Zoey was 3 when her family was moving out of the country for work. Her family thought they had found a new home for her, but at the 11th hour the potential new owners changed their mind. With no time left before their move, Zoey’s owners were very relieved that she would be welcome at YGRR and we would find her the perfect new home. Zoey had a checkup with our vet and was soon on her way to Riverview. She was a typical playful, bouncy young girl. She was very sweet and cherished getting attention. She loved to spend time in the adoption room. Unlike most of the Goldens, however, Zoey had no interest in the toy box and just wanted to be loved. She enjoyed going for walks in the woods, as well. In fact, any activity that involved spending time with people was A-okay with Zoey! Once Zoey had settled in and we had gotten to know her, it was time to find her the right match. 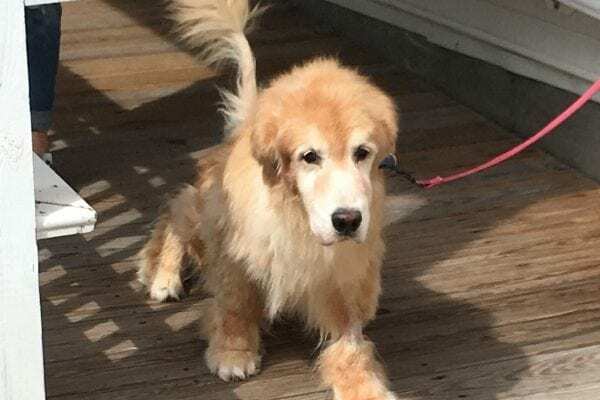 A wonderful family that had recently lost their senior Golden boy was looking to offer another lucky Golden a home. Zoey is now the center of attention in her new home, which is just how she likes it! Although car sickness was reportedly a problem for her, she made it home like a trooper. She wasn’t sure if the scarecrow that greeted her in the driveway was friend or foe, but despite her trepidation it didn’t take long for Zoey to take to her new home. 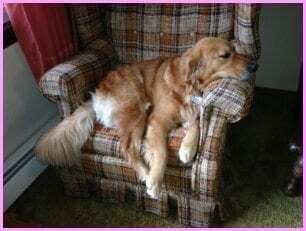 Her previous family had reported that Zoey did not get on the furniture. Zoey did not read her own biography, however, and the first thing she did when she walked in the door was jump right up on the furniture and make herself comfortable! Although Zoey was initially a little insecure and didn’t want to be too far from her adopters, she soon learned that this was her new home and she was there to stay. Zoey has settled in and loves her new family and her new home. For their part, Zoey’s adopters report that she is very sweet and they could not be happier with their new addition! Zoey thanks you for your support. Zoey was sweet and a little insecure with her change in circumstances. We gave her the time to adjust and show her true personality so we could make her the right match for her new home. Our individualized approach for each dog in our care is made possible due to your generosity. Zoey and all the Rescue Goldens thank you and send big wags and kisses your way!